Our final guest of season two is an artist, songwriter, and producer hailing from the hip-hop scene of Detroit, Michigan. He was still a student at Duke University when he came up with the idea for his first single "Cooler Than Me" which went on be a multi-platinum hit and earn more than 3 million in sales in the US. Since then, he has become one of the industry’s most in-demand songwriters, penning hits for the likes of Maroon 5 ("Sugar"), Justin Bieber ("Boyfriend"), Big Sean ("Don't Tell Me You Love Me"), and Labrinth ("Beneath Your Beautiful"). His self-penned triple platinum smash “I Took a Pill in Ibiza” from his sophomore album ‘At Night, Alone’ hit #1 in the US and earned him a Grammy nomination for Song of the Year. In addition to a successful solo career, he is a member of the alternative hip-hop duo Mansionz with blackbear. We’re honored to have our season finale feature this inspirational artist and songwriter. And the writer is…Mike Posner! It is hard to find a songwriter more dedicated to spreading positivity and truth through music than this next guest. He is a multi-platinum hitmaker who is the first male pop star in a decade to reach the Top 10 on Adult Pop Radio with "Keep Your Head Up" and "Fine By Me" off of his debut self titled album. This success paved the road for his follow-up album ‘Magazines or Novels’, featuring his triple-platinum best selling song "Honey, I’m Good". Also featured on the album was his certified gold single "Good to be Alive (Hallelujah)". More recently, his highly anticipated third album, ‘The Good Parts,’ was released just last Friday, which includes his hit "Give Love (feat. LunchMoney Lewis)" as well as charting singles "Fresh Eyes" and "Smoke Clears". And The Writer Is... The genuine, the authentic, Andy Grammer! Our next award-winning guest is without a doubt a lyrical genius. Born and raised in Los Angeles, this unstoppable hitmaker has been singing, with large thanks to her musically gifted father, since she was 3 years old. Growing up she preformed in theatre, cabaret and comedy improv, then moved to the Big Apple where she joined an acclaimed vocal quartet before realizing her love of music resides in songwriting. She is responsible for crafting David Guetta’s #1 hit "Dangerous (feat. Sam Martin)", the top 10 charting single "Skyscraper" for Demi Lovato, as well as the 2006 Disney Radio Song of the Year "Cinderella" by The Cheetah Girls and most recently, "No Goodbyes" off Dua Lipa’s self titled album. With writing credits for major artists such as Jason Mraz, One Direction, Brandy, Fifth Harmony, Rachel Platten, Faith Hill, Britney Spears, Backstreet Boys and Toni Braxton, it comes with no surprise that this multi-platinum songwriter is one of the most highly sought after in the game. She is an ASCAP Pop Award winner for the songs "Want to Want Me" by Jason Derulo, "Classic" by MKTO, "Tonight, Tonight" by Hot Chelle Rae, and "What’s Left of Me" by Nick Lachey. It is our sincere pleasure to announce, And The Writer Is…Lindy Robbins! Our next guest is an 11-time Grammy Award winner with a career that has been nonstop for nearly 4 decades. He has earned more than 200 Top 10 R&B hits, over 50 Top 10 Pop singles, and 16 #1's. As the co-founder ofLaFace Records with L.A. Reid, he is responsible for nurturing the careers of megastars such as TLC, OutKast, Usher, P!nk, and Toni Braxton. As if that isn’t impressive enough, the ‘For the Cool in You’ artist has penned hits for legendary superstars Whitney Houston, Michael Jackson, Barbra Streisand, and Celine Dion. Some examples of his masterful work are “I’ll Make Love To You” by Boyz II Men, “Best Thing I Never Had” by Beyonce, “Take A Bow” by Madonna, "Another Sad Love Song" by Toni Braxton, and “We Belong Together” by Mariah Carey. With credits such as these, he has earned himself numerous awards and honors from the Soul Train Music Awards, BMI Awards, NAACP Image awards, American Music Awards, BET Walk of Fame Award, receiving a star on the Hollywood Walk of Fame in 2013, and most recently, was inducted into the 2017’s Songwriter’s Hall of Fame. Not to mention he is also quite the passionate philanthropist. Currently working on his next solo album, we are honored to say, And The Writer Is…Kenny “Babyface” Edmonds! Our next guest is a Berklee College of Music graduate who has worked with some of the most noteworthy pop artists of the past few years. With co-writing and production credits including the #1 hits “Good For You (feat. A$AP Rocky)” by Selena Gomez and “Jealous” by Nick Jonas, this multi-platinum writer and producer is paving the way for an unstoppable career. Additionally, he has penned the top 10 hits “All In My Head (Flex)” by Fifth Harmony and "Feel This Moment (feat. Christina Aguilera) by Pitbull, as well as “We Own the Night” by The Wanted, “Body Say” for Demi Lovato, Rita Ora’s #3 UK hit “Poison”, “Believe” and “All Around The World” by Justin Bieber, and Daya's recently released single “New". He was raised in London and moved to Los Angeles by way of Boston after college. 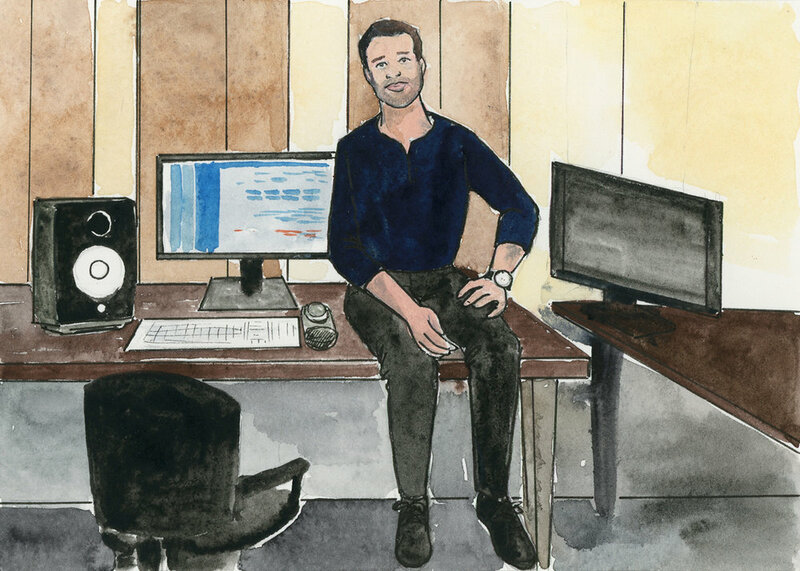 This determined songwriter (and master cold-caller) is an inspiration for any writer and is now one of the most sought after producers in pop music at the young age of 27! And The Writer Is... Sir Nolan Lambroza!